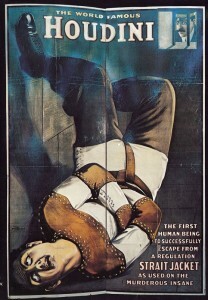 A vintage Harry Houdini poster. Michael Lauck talks about the collecting of magic and its related items. On this week’s Antiques Auction Forum podcast, Martin Willis speaks with Michael Lauck about the history of magicians, including women in the field, Houdini, collecting ephemera, posters, props and more. This is a fascinating interview with a specialist that really knows his topic. Check out a blog post Michael wrote for the forum and also iTricks. Martin Willis is Worthologist, auctioneer and director of decorative arts for James D. Julia Auctioneers for the Boston region. You can hear his podcasts at the at Antique and Auction Forum, featuring interviews with key players in the antiques and collecbles trade.